A well-designed chair can make a big difference when it comes to productivity at the workstation. A chair with proper support for your back, legs, tush and arms can reduce inconvenient postures, stress, and unnecessary exertions. 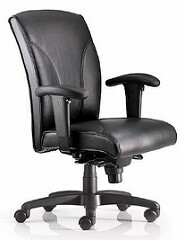 Office chairs with recline or height adjustment levers allow for more comfort for the user in a variety of sitting positions. If multiple users use the same chair on different shifts, this feature is all the more convenient. If your armrests are not adjustable or have not been adjusted for your comfort, you may be working in awkward sitting positions. • If armrests are too low, you’ll be leaning forward, causing back, neck and shoulder pain. • If armrests are too high, you’ll be maintaining raised shoulders, causing in muscle tension and fatigue in neck and shoulders. • If armrests are too wide, your elbows will be reaching outward for support, resulting in muscle fatigue in the shoulders and neck. • If armrests are too narrow, it would restrict movement getting in and out of the chair. • If armrests are too large, it may interfere with other office equipment or desk. If your chair is further away from the keyboard, you will be reaching and leaning forward, causing strain in the lower back, arms, shoulders, and neck. If you are experiencing any of the above problems, remove the armrests or stop using them. Reposition the armrests so they support your forearms close to your torso. Most modern chairs should allow for adjustable armrests. Poorly designed backrests may result in incorrect posture and increased back aches. Sitting in uncomfortable chairs, for prolonged periods of time, may lead to back pain and fatigue. 1. If your current office chair does not have lumbar support, roll up a towel or pillow to provide support the natural S-curve of your spine. • A height-adjustable lever that can fit comfortably on the lower back. • A recline-adjustable lever that allows the user to lean back at least 15 degrees from the vertical. The backrest should also be able to lock in place in the vertical position to allow users to sit up right. • A device that allows the backrest to move forward or backward. This will allow shorter workers sit with their backs against the backrest and not have to sit on the edge of the seat. Taller workers can sit against with their backs against the backrest while having their feet resting on the ground. Poor choice of casters, or using a chair without casters, can make in-chair adjustments or repositioning difficult. This usually results in reaching for or bending toward the keyboard, causing muscle strain and fatigue. • Chairs should have a strong, five-legged base. • Ensure that chairs have appropriate-sized casters for the type of flooring at the workstation. Sitting in a chair with a seat that is too high may result in an uncomfortable working position. Your feet will be unsupported, or you will be forced to sit on the edge of your seat, preventing the natural S-curve of your spine. These awkward postures can lead to increased fatigue, restricted circulation, swelling, numbness, and pain. • If the seat cannot be lowered, use a footrest to provide stable support for your feet. • Use a chair with a seat pan that can is adjustable and large enough to support a variety of seated positions. We recommend padded edges and that are wide enough to accommodate most hip sizes.